The Rjukan region in Norway boasts the most extensive range of tracked and off-piste Nordic skiing in a wonderful remote wilderness setting. The CADETNORSKI expedition is a 6-day course designed to teach students the basics of Nordic skiing. The content includes clothing and equipment, winter hazards, basic understanding of waxing, diagonal stride, double poling, changing track, step turns, basic skating technique, plough, plough turns. The course concludes with an overnight self-supported ski tour staying in a DNT mountain hut. 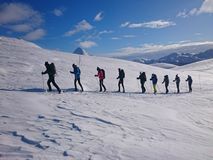 The outcome of the course is for the candidate to successfully complete the Ski Foundation (SF1) Nordic by demonstrating a competent level of skills to be an effective member of a led group on a ski touring expedition.